Abstract base class for dataseries that can be drawn on a WCartesian3DChart. The model that is provided at construction or with setModel() contains the data of a dataseries. Implementations of this class format the data for representation on the chart and perform all necessary drawing operations. Note that if a dataseries holds numerical data it should be added to a chart of type ChartType::Scatter, if it holds categorical data it should be added to a chart of type ChartType::Category. A chart-palette will specify one color for the entire dataseries. Each new dataseries on a chart will receive another color. A colormap assigns different colors to the data within one dataseries, based on the z-value of the data. WStandardColorMap provides an easy way to create a colormap that is either smooth or consists of a number of bands. Some representations of the data ignore these roles. For example, when a surface is drawn, the roles are ignored. When the existing implementations of WAbstractDataSeries3D don't meet your needs, you might want to make your own. When doing this there are some details of the chart that you should know. The chart is made so that when a property of the chart changes, which affect any of the GL resources, all GL resources are destroyed and re-initialized. This eliminates the need to determine which chart-setting affect which GL-resources, which can be a complicated problem. Therefore only unchanging GL resources are initialized in initializeGL(). The initializeGL function in the chart is implemented to immediately request a call to updateGL(), which then initializes the rest of the GL resources. Every call to updateGL in the chart, will first call deleteAllGLResources() on all dataseries and will then call updateGL() on all dataseries. So, when implementing a dataseries: initialize unchanging GL resources in initializeGL(), initialize the rest of your GL resources in updateGL() and make GL-delete calls to all resources initialized in updateGL() in the function deleteAllGLResources(). It is also best to check isNull() on each of your GL-resources when deleting them. This constructor takes a WAbstractItemModel as an argument. The model contains the data of this dataseries. How the model should be structured is dependent on the implementation. Therefore this information is found in the documentation of classes deriving from this one. Returns the colormap used by this dataseries. If this dataseries has no colormap set, 0 will be returned. Returns on which side the colormap is shown. Returns whether the colormap is shown alongside the chart in the form of a legend. 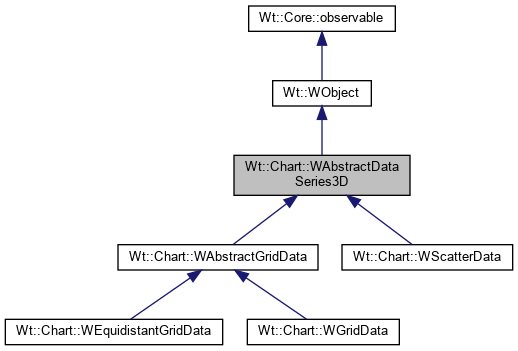 Implemented in Wt::Chart::WAbstractGridData, and Wt::Chart::WScatterData. Returns if this dataseries is hidden. Returns whether this dataseries is included in the chart-legend. Implemented in Wt::Chart::WScatterData, Wt::Chart::WAbstractGridData, Wt::Chart::WGridData, and Wt::Chart::WEquidistantGridData. Returns a pointer to the model used by this dataseries. Returns the pointsize for drawing this dataseries. Returns the point sprite used for drawing this dataseries. Sets the colormap for this dataseries. Ownership of the WAbstractColorMap is transferred to this class. By default there is no colormap set. When a colormap is set on a dataseries, the color of WCartesian3DChart::palette() is no longer used for this series. The colormap associates a color to the data based on the z-value of the data. If the colormap is set to 0, the value of the palette will be used again. Sets whether the colormap is shown on the left or right. The default side is Side::Right. Note: only Side::Left and Side::Right are valid values for this function. Sets whether the colormap that is used should be shown alongside the chart in the form of a legend. Sets if this dataseries is hidden. By default dataseries are visible. Sets whether this dataseries is included in the chart-legend. By default, dataseries are enabled in the legend. Sets a model from which the dataseries gets its data. Every dataseries needs a model from which it gets the data. How the data is structured is determined by the type of dataseries. Therefore more info on how to construct a proper model is provided in classes that derive from this one. Sets the pointsize for drawing this dataseries. The default pointsize is 2 pixels. Note: Setting the point-size is currently not supported in IE. Set the point sprite used for drawing this dataseries. This should be a local (server side) path to an image, such as a PNG or GIF. Only the alpha channel of this image is used: the sprite only decides if a pixel in the point appears or not. If the alpha value is below 0.5, the pixel is discarded. For best effect, the point sprite's width and height should be the same as the pointSize(), and the chart's antialiasing should be disabled. Defaults to the empty string, meaning that every pixel of the point will be drawn, yielding a square. Sets the title of this dataseries. When a dataseries that did not have a title set, is added to a WCartesian3DChart it automatically gets the default title 'dataset i', with i the count of how many dataseries have been added to the chart. Returns the title of this dataseries.